Novel Spirits is a collection of handpicked rare and unique spirits imported from Mexico. Tequila and Mezcal are well known Mexican Spirits that have hit the market in a big way. 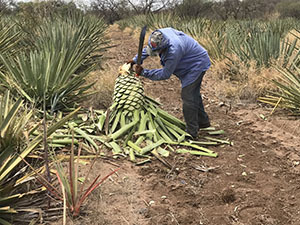 However, most consumers of Tequila and Mezcal are not aware that there are many hidden treasures of rare and unique Agave spirits they have yet to experience. Mel Abert Jr. CEO and Founder of Novel Spirits Collection discovered Bacanora at a small liquor store in San Carlos, Mexico. Intrigued, he tasted it, liked it, researched it and discovered Bacanora had an incredibly colorful 300 year history of being distilled exclusively in the State of Sonora, Mexico. Additionally, it was rarely exported out of the state of Sonora. As a result, Mel, started importing Bacanora into London creating the Novel Spirits Collection Company to test the acceptance of this new exciting liquor. It was a big success. Now, Bacanora sold by Novel Spirits Collection is becoming available in the United States and Europe for the discerning Agave aficionado. Perfecto! All Novel Spirits Collection products have been approved and certified by the Alcohol Regulatory Commission of Mexico.